Ardent John Wick fans will remember the moment in which Keanu Reeves and Peter Stormare shared the screen in Chapter 2, when the latter plays Viggo’s snarling brother Abram Tarasov. But the pair’s history stretches back further still to Swedish Dicks, Private Investigators, the single-camera comedy series in which Reeves features in his first major TV role. Having premiered via Viaplay first, we now have confirmation that Pop TV has swooped in to acquire the property as part of its robust slate of new original programming. Also starring comedian Johan Glans as an aging ex-stuntman, Swedish Dicks, as the name suggests, chronicles the story behind an L.A.-based private detective firm. Stormare dreamed up the idea back in 2014, and two years later the show had developed enough of a cult following to warrant a second season, with Keanu Reeves on board in a recurring capacity. 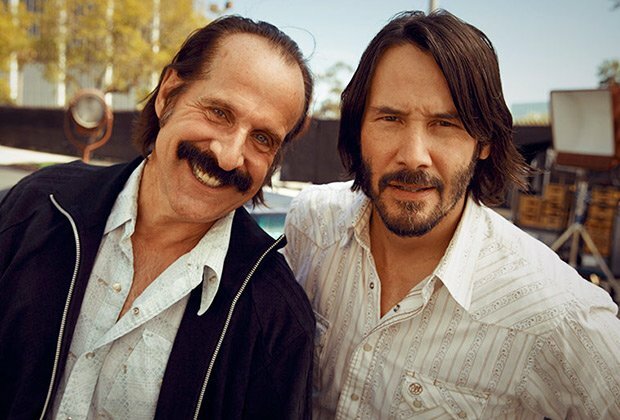 Swedish Dicks, Private Investigators stars Peter Stormare (“John Wick: Chapter 2,” “Fargo,” “The Big Lebowski”), Johan Glans (Best Male Comedian, “Swedish Comedy Awards”) and features Keanu Reeves (the “John Wick” and “The Matrix” franchises) in a single-camera comedy from Lionsgate and Viaplay about an aging ex-stuntman stuck in the past and an overly optimistic Swedish DJ stuck in the digital world. Together they get unstuck by forming the private detective firm Swedish Dicks – solving some of the strangest and wildest cases LA has ever seen. Season one of SWEDISH DICKS, PRIVATE INVESTIGATORS will premiere with 10 episodes in fall 2017, featuring guest stars Traci Lords (Cry-Baby, Melrose Place), Anthony Lapaglia (“Without a Trace,” “Frasier”), Eric Roberts (“The Dark Knight,” “Suits”) and Margaret Cho (30 Rock, Drop Dead Diva). Filming on the second season of Swedish Dicks, Private Investigators kicks off this summer ahead of an expected premiere in late 2017. Reeves, meanwhile, is said to be kicking around ideas for John Wick: Chapter 3 with director and long-time collaborator Chad Stahelski – and if Samuel L. Jackson has his way, the third film in the pulp action series could well make room for the great SLJ.